By popular demand, here is a computer desktop wallpaper version of my teepees and fireworks photo. Click on the photo to enlarge, then right click and "Set as desktop background." Poster prints, mousepads and other items with this image are now available at http://www.cafepress.com/dakotagraph. UPDATE 7/15/08 To make sure I was happy with the quality, I ordered one of the Large Posters from this site and I'm thrilled to report that it looks very good. If I was paying more, I would expect a little truer colors and better contrast ratio, but for this price I was very happy with the results. I also have several of the shirts and have not been disappointed in any of the products available. This is a really great photo. Did you take it in Fort Pierre? I will have to steal that idea next year: we spend every Fourth in Fort Pierre, braving WWIII and having a great time. 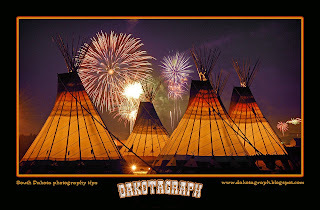 That's one terrific tipi/fireworks photo, and the shot across the water is just as good. I can also vouch for "anything goes"...the house that my mother-in-law owns is just under Black Top, at LaFramboise and Casey Tibbs...ground zero for armageddon, in other words. Thanks for sharing! Yep, that neighborhood looks and sounds dangerous every year. I'm disappointed you didn't call when you were in the area, though. Stop by any time! Chad, that photo is awesome!! It was neat reading comment from Greg as know him personally and you are both tops in photography! South Dakota is very fortunate to have such talented young men that has this eye for such spectular photos. I left South Dakota in 1989 to pursue career opportunities in Washington, DC. I had the fortunate pleasure of working with Paul Horstead when he worked for South Dakota tourism. "You" photographers never cease to amaze me. Your teepee picture is incredible and I have enjoyed sharing it with all my East Coast friends. You can take the girl out of South Dakota, but you can't take the South Dakota out of the girl. A very proud South Dakotan! Thanks everyone. I'd have to say this photo is turning out to be one of the most popular I've ever done. Get your copy now at the Cafe Press link.